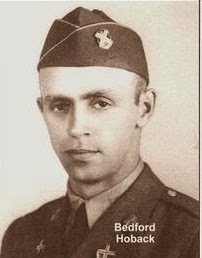 Bedford and Raymond Hoback were one of 33 sets of brothers fighting together on the beaches during D-Day, June 6, 1944. Of the 33 sets of brothers, three sets were from Bedford (the Stevens twins and the Powers brothers were also from Bedford) and part of Company A, 116th Regiment, 29th Infantry Division. The story of the Hoback brothers was one of the first I heard that put a “face” to the history. I was in the education tent with about 60 students from a North Carolina high school who were working on a special project about Bedford and D-Day. I had only been at the Memorial for a few months at that point and this was the first time I had the pleasure of meeting Mrs. Lucille Hoback Boggess, sister of Bedford and Raymond, and hear their personal story. You could have heard a pin drop as everyone hung on to what Mrs. Boggess had to say about her brothers, and all were keen on seeing some of the personal belongings she had brought to share with the group. It is their story that I tell to the children when they come to visit the Memorial for a field trip; their story that I share when talking to guests about the ultimate sacrifice paid by over 4,000 men on D-Day. It is their story that I want to share with you today through the words of Mrs. Boggess. My two brothers, Bedford and Raymond, both joined the National Guard, but the attraction was not financial. 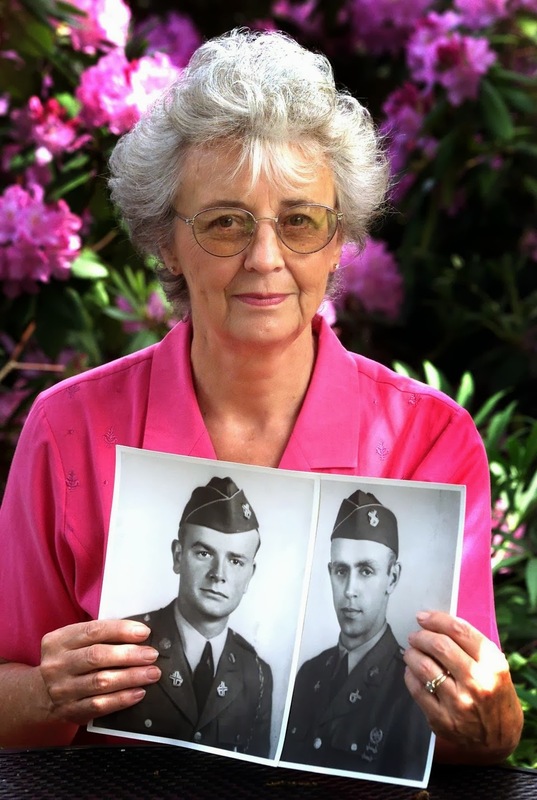 The thing that drew them – drew Bedford anyway – was the idea of service. He believed in it. I should tell you that when Bedford joined the National Guard he was no boy. He found military service to be something he wanted to do – not full time, of course, but once every few days it felt pretty good. I think he liked the order the military represented, its discipline, teamwork, and fellowship. 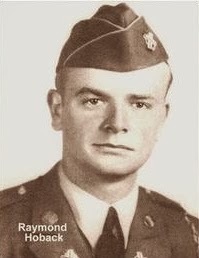 Raymond’s motivation may not have been quite so well informed, but I must tell you that he too, was a man. Although four years younger than Bedford, he was not kid, but he did have a kid brother’s admiration of his older brother, and that is probably why he came to the Guard. And I think he liked to dress up in his uniform – liked to look and feel like a soldier. Raymond received a Bible from my mother as a Christmas gift when he was eighteen. Receiving your own Bible was to undergo a rite of passage, and we took it seriously. Raymond certainly did, and he kept his Bible close at hand. I know he took it with him when the Bedford company mobilized in 1941. Before the mobilization, the company would go off to this or that army camp to train for a week or two. When they came back at the end of maneuvers, everybody would turn up to welcome them home. One of my strongest memories is of the joy in the faces of those boys as they climbed off the trucks, because they knew their lives could get back to normal. Once the company mobilized, though, the boys did not come back except as individuals whenever they could manage a pass or furlough. Their joy on coming home was real enough, but the army was a greater reality. After Pearl Harbor, so was the war. In June of 1944, I had just finished my freshman year, I was looking forward to spending large chunks of the summer at Bedford County Lake, and I was a long way from the frontlines. A few days into the month, though, we learned that our boys overseas were on them. We did not know who was where or how anyone was, but our faith was strong and our hopes remained high. In the weeks following D-Day, we heard reports of fierce fighting as the Allies moved deeper into France. What we did not hear was any news about the Bedford company, or from Bedford and Raymond. We were concerned, and as the days passed, our concern became fear, and fear, finally, a nightmare. One Sunday in mid-July (July 15, 1944) everyone was getting dressed to go across the road to church. An unexpected knock came through the door, and my father opened it to the sheriff. Looking pained and mumbling a few words to Dad, the sheriff handed him a piece of paper – a telegram. “The War Department regrets to inform you,” it began, “that your son, Pvt. Bedford Turner Hoback has been killed in action.” The news that everyone in town had been expecting, had been dreading, was finally here. It was here – in our house. Our house. We were stunned. Scarcely comprehending the loss but painfully aware of my parents’ grief, I watched my mother’s tears begin, and my own followed. 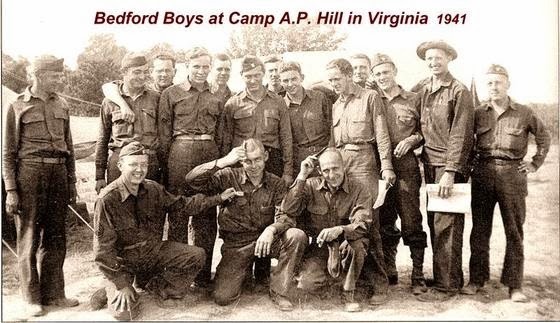 When the company left town in 1941, more than a hundred boys left with it, but by June 1944, as a function of reassignments and such, only 35 of them remained in the company, which had been brought up to strength with soldiers from all over the country. Bedford had been one of the 35. Throughout the rest of that Sunday, telegrams were delivered all around town, and family after family struggled to absorb that blow. The next day, in our childish way, my sister Rachel and I thought we might cheer our folks up by making them some ice cream. We were over the freezer cranking away when there was another knock – another telegram. “The War Department regrets,” the too-familiar preamble read, “to inform you that your son, Staff Sgt. Raymond Samuel Hoback is missing in action.” Mom and Dad were overcome with grief and I along with them. To this moment I can remember nothing else that happened that day. Time simply stopped. Raymond was never found. Several of his company mates subsequently reported seeing him lying on the beach near water’s edge, whether wounded or dead they did not know. What is clear is that he, along with dozens others like him, was taken by the tide into the sea. A word now about Providence, which manifested itself in the form of a package that arrived at our house a few days later. It was a book sent by a soldier from W. Virginia, who had landed a day after Raymond had gone ashore. “While walking on the beach on D-Day plus one,” he wrote, “…I came upon this Bible, and as most any person would do I picked it up from the sands to keep it from being destroyed.” It was the Bible she had given Raymond for Christmas in 1938. It was her only tangible connection to her missing son. She treasured it for the rest of her life, as I treasure it today. 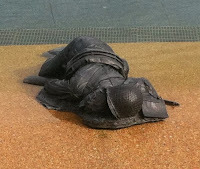 We work hard every day at the National D-Day Memorial to keep the story of D-Day alive. Bedford, VA suffered the highest per capita loss of any town in the USA, losing nineteen young men in the early morning hours of the invasion. On June 6, 2014 during the 70th Anniversary of the Invasion we are hoping to dedicate a new statue, Homage, to the memory and honor of the Bedford Boys. For more information, or to contribute to Homage, please visit our website. Help us bring their story to life; help us bring their story home. Touching and beautiful. Thank you for posting. Wow, very touching indeed! So proud to be a part of such history. Lucille Boggess was a friend of my mother's. Thanks for this moving story. My all family has always been full of respect for the soldiers who accepted the risk of dying or being injured to liberate Europe. 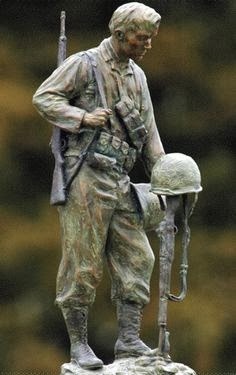 I'll travel from Montreal to Mexico in June 2014 and I would love to stop a moment in Bedford VA to meditate in the memorial and give thanks to the Bedford community for all the sacrifices this small village made during the 2nd War. so much to this mother giving it to her son, we have our bibles shouldn’t we pick it up start to read it. I spend so much time over in Normandy. 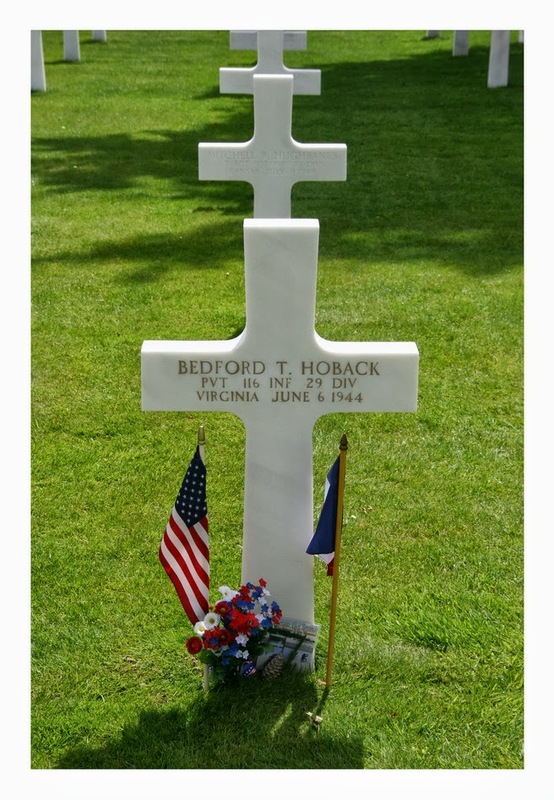 I go over every D Day & on 6th of June this year i went on to Omaha Beach & wrote Bedford Hoback’s name in the sand as close as i could figure to where he landed and died. I then attended the memorial service just off the beach in Vierville Sur Mer. Then i went upto the American Cemetery and found All 19 of the Bedford Boys graves in there. Starting with Bedford Hoback. I spent a few minutes with each of them. Then i went and located Raymond Hoback’s name on The Walls Of The Missing. I will be back there Next Year for D Day 75th Anniversary. I for 1 Will NEVER Forget the Sacrifice All the boys of the Alied Force gave.